Make your style statement with this bright orange colored kurti. The kurti has embroidery and string attached at the yoke which gives it a western touch. 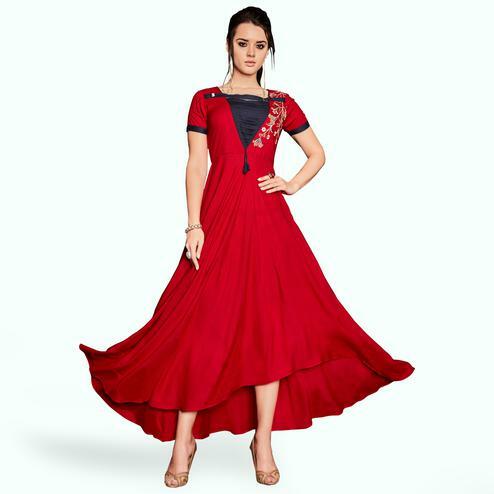 The kurti is stitched and has 3/4th sleeves of contrasting colors which makes it look so elegant.This stitched kurti is perfect to pick for parties,kitty parties,family functions, weekend get-together, parties and events. Pair it up with churidar or jeans to create a contrasting effect, along with heels & stylish accessoires.This attractive kurti will surely fetch you compliments for your rich sense of style.